Hand Engraving on sterling silver, Silver Trophy cup, Silver Wedding Cups, Anniversary And Racing Engravable sterling silver NYC, New York. 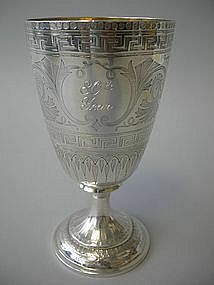 Antique silver wine cup purchased and engraved from Nelson & Nelson. A son's gift to his father on his 80th birthday. 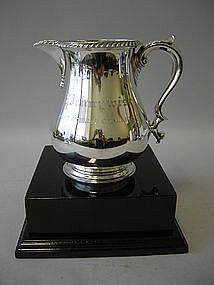 Kennel Club Trophy Pitcher purchased and hand engraved from Nelson & Nelson Antiques. Trophy base from Nelson & Nelson also. 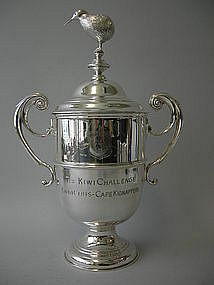 THE KIWI CHALLENGE CUP for The New Zealand Golf Tournament. This cup was purchased from us and hand engraved by Nelson & Nelson.